Local 1700 members are beginning to focus on December balloting for the union’s president, executive vice president and financial secretary/treasurer, and for the regional vice president who represents their city. The Executive Board has gone through significant changes since the 2010 election due to promotion, retirement and death. Local 1700 is determined to hold Greyhound accountable for its role in driving up health risks. Meanwhile, members can lower their 2014 premiums by participating in at least one ‘Healthy Hound’ activity by October. It’s time to stop living in the past. It’s time to look forward and fight for a better future. SOLIDARITY ROAD - SPECIAL EDITION: Local 1700 Executive Board unanimously recommends members ratify tentative agreement that raises all wages, pays drivers for all time at work, returns all subcontracted work. Public service announcement timed with Mother's Day to appear on English and Spanish TV, Websites, and union bulletin board posters. Greyhound officer tells Uniform Committee he is negotiating with a short list of other garment makers, but refuses to consider a union shop proposed by Local 1700. "As family members who have lost loved ones in motorcoach crashes, we are frankly incredulous that Greyhound would now turn your back on the commitment you gave us." 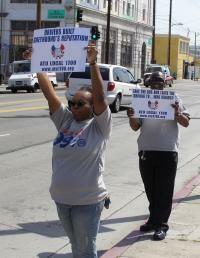 Local 1700 picketers in Texas, Arizona and California warn passengers about "bait and switch" scam. Union files charges with National Labor Relations Board. Sandra Frye to Serve as Executive V.P. 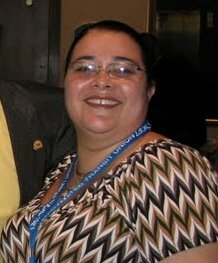 Sandra Frye, the union's chief steward in Orlando, Florida, will complete Jimmie McCoy's term as Executive V.P., while McCoy fills out the late Ron Jordan's term as Region 3 Vice President. Update your smart-phones! ATU President Larry Hanley recently appointed driver Natalie Perez to the international union's Field Mobilization Department. Perez, who has been based in Cleveland since 2003, has served as a Local 1700 steward and organizer. Also, change Perez's surname to Cruz. She and her high school sweetheart, William Cruz, tied the knot in April.